Disclaimer: There are affiliate links in this post. This means that at no cost to you, I will receive a small commission if you purchase through my link. I will only ever promote the products and services that I trust, have personally used and 100% recommend. You may read my full disclosure policy for more information. Thank for supporting my business in this way. ConvertKit is my email marketing weapon of choice these days. It offers so (so!) much functionality for the price. Today I want to give you a power tip to expand the ConvertKit functionality even further. 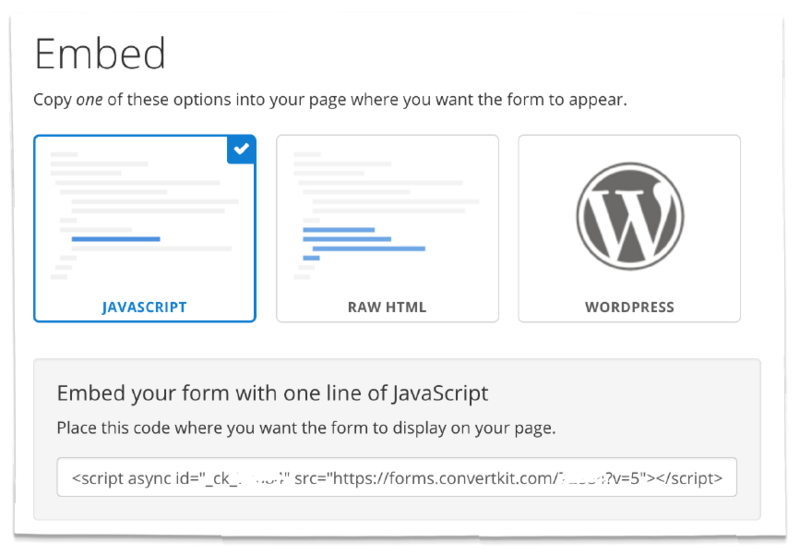 One of the form options within ConvertKit is a modal form. This allows you to include a popup anywhere on your website, triggered by scrolling, timing or exit intent. There’s also the option to target the modal with a link; however, it’s been asked many times: How can I link a button or image to a ConvertKit popup modal form? This option is incredibly useful for landing or sales pages, but can also be nice to use within a blog post for content upgrades as well. Today, I’m helping answer that question with a tutorial. I always set the Timing for 999999999. This ensures that the form won’t pop up while the reader is on the page; they must click the button/image. This is especially useful if you already have a popup form implemented. Your decision will depend on where you need to include a modal popup. On sales pages I would recommend a button, but within a blog post you may want to add an image. Do what feels right to you! If you want to use a button, it’s pretty simple to create. You can change the background color, font color or even the opacity for the hover if you’d like. Don’t be afraid to play around with it. Then anywhere you want the button, you’ll add the following code. 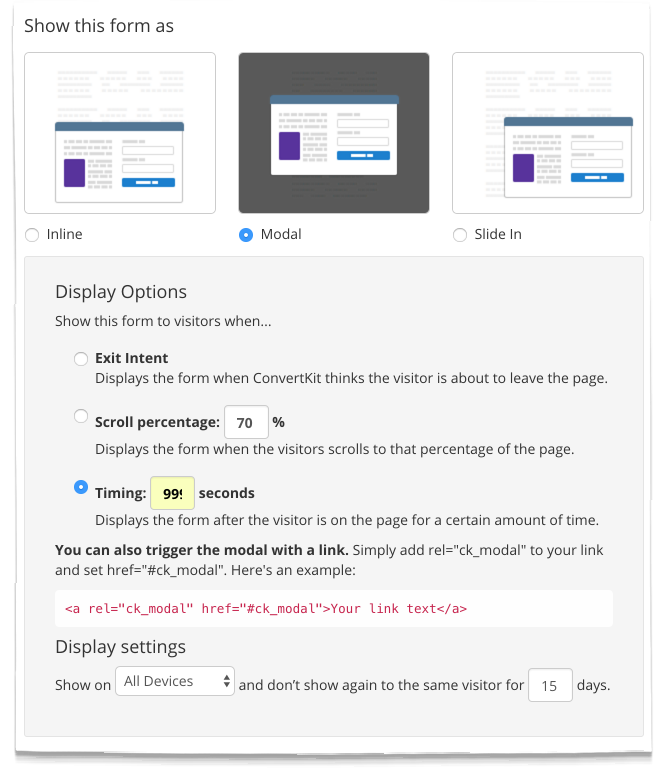 This includes the ConvertKit modal trigger code. You could place this multiple times if you’d like multiple buttons on a page. You can add this image anywhere you want on your page or post. You could even add multiple images or a combination of images and buttons. Don’t go too overboard, though, you don’t want to turn away your audience. Finally, you need to add the form so the modal trigger has something to connect with. If you’re using WordPress, you can download the ConvertKit plugin. (Not a requirement, you could still use the other embed options.) You can then choose your form on an individual page or blog post. You will then choose your form on an individual page or blog post. Select the form from the drop-down menu. Now save your blog post or page and you’ll be all set! 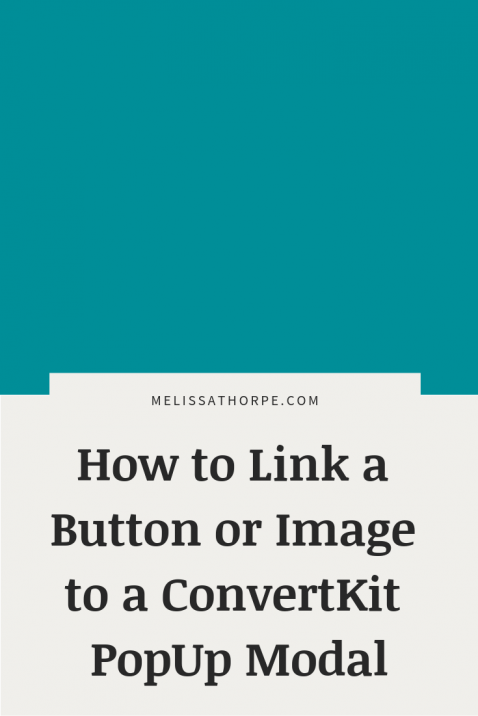 If you need help setting up ConvertKit, I can help! P.S. If you need multiple modal forms on a page, you’ll want to read this post. Great walkthrough. By chance, have you figured out how to make the modal scroll on mobile? So, your example here isn’t large enough to need that, but mine is. I see it work on Pat Flynn’s site (smartpassiveincome.com scroll to the very bottom subscribe button). I can’t get that to work on mine. It scrolls the background instead, which is the default. If you want to see it not work, mine is on nickblevins.com, the 30 Apps image, but the one on the bottom right (not the top right). If you can figure that out I’d be happy to pay you for the solution and I know it would help other CK users. Let me know what you think. Hey, Nick! Great question. Let me look into that and I’ll get back to you about a solution soon! Sorry for the delay. So Pat isn’t using the ConvertKit standard form embed. His is (probably) custom and the entire form is actually within another container. So that larger container prevents the background from scrolling and then the form scrolls within it. If that makes sense. Melissa you are a genius! Thanks so much for creating this. I use the DIVI WordPress theme and it makes you crave beautiful stuff, including buttons. It is frustrating the Convertkit team hasn’t added this functionality to their signup functionality. I am all onboard with simple emails, but our websites/posts need to look great! doesn’t seem to do it. Any suggestions? For the font-weight, I would try giving it a number. 600, 700, 900, etc. It can depend on the font though. The bold version may not be installed on your website or the font may not have a bold version at all. Hi Melissa! Does this still work with Convertkit and the new CAPTCHA change? Yep! The captcha doesn’t occur until after someone tries to sign up multiple times. So linking an image or button to a popup will still work! PERFECT!!!!! Just needed this exact feature and got it working beautifully in just a few minutes – THANK YOU! So glad it worked for you Heidi! So helpful, thank you, Melissa. This post was linked from an FB group of Divi users, so obviously I’m using Divi theme. I’m wondering if I want to use this with Divi will I need to put it into code module? That seems like the way to do it, but I’m really not sure. Thanks for all the coding goodness you offer here! You should be able to just use a Text module and add the code in the Text tab! I cannot seem to figure this out! I’m trying to add a button but when I add the code and preview it’s not working. Whomp, whomp. Any tips? You’ll want to make sure you save the page with the ConvertKit form before adding the button and previewing it. Hope that helps! Hey Melissa, Great post. I used your tips that you shared in another blog post of yours on modal forms for tutorial on how to do this for Squarespace! Just a note though, the final link “I can help!” is not working. I’ve followed your instructions, but unfortunately it just doesn’t work for me! I’m using Squarespace – have you got any suggestions? Unfortunately, I’m not familiar with Squarespace. Sorry!